The “Morbid Fear of the Subjective” (copyright by Roy Wood Sellars) represents a key-element of the American naturalist debate of the Mid-Twentieth century. On the one hand, we are witnessing to the unconditional trust in the objectivity of scientific discourse, while on the other (and as a consequence) there is the attempt to exorcise the myth of the “subjective” and of its metaphysical privateness. This theoretical roadmap quickly assumed the shape of an even sociological contrast between the “democraticity” of natural sciences and the fanaticism implicit in supernatural metaphysical systems. In between these two extremes stood phenomenology, in its early days on American soil. Its notion of “evidence”, which not so easy to naturalize as it might seem, was in fact hardly consistent with the widespread concept of “natural experience” of the world. Nunziante, A. (2013). The "Morbid fear of the subjective": Privateness and objectivity in mid-twentieth century American naturalism. Metodo. 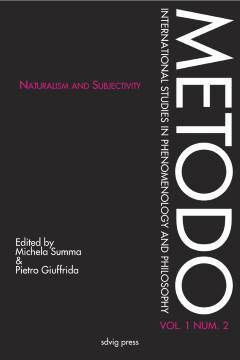 International Studies in Phenomenology and Philosophy 1 (2), pp. 39-57.